Animal Husbandry has been around for many years. It was first started in 1857 when an agriculture college was put into place. Every since then animal husbandry has been a popular thing to major in. At one time a major in animal husbandry had more people then a major as an electrician. Things started to sky rocket for the agriculture world with a curriculum which established in 1897. Since then many majors have developed through this time and many careers have been open. Company’s have been developed which were created to help animals in need. Even things such as abuse during animal husbandry, company’s have been developed to rescue and battle the abuse which is given to the animals. Animal husbandry started off with a group of men establishing a college for farming. It started off in 1857, debating where this college campus would be held at. Finally in 1859 they acquired land and a campus to pursue their college. Donations poured in and the college was well on it's way within a year of purchasing the land. One of the first teachers to teach on Agriculture was Norton S. Townshend. He was also the first person to hold the Chair of Professor of Practical Agriculture. Dr. Townshend came from a background of getting his medical degree and then going on to be a surgeon in the army, and later into Congress. He finally transferred over to his main love, agriculture. Both President Welch and Dr. Townshend met with the group of students at a picnic to celebrate the college's grand opening. But later on Dr. Townsend retired after only serving 10 years at the college. After his resignation there became many conflicts at the campus. Many professors wanting to teach different things and ways confused the students and therefore went downhill. However there came a solution. In 1897 there became an Agriculture/Animal Husbandry curriculum provided for the schools who which to teach on these things. This helped solve a lot of the conflicts people had with each other. After all these conflicts were solved Animal Husbandry was becoming famous. Majors then became available to the students. Things such as Bachelor in Science Agriculture which tested their knowledge of Animal Husbandry, Agronomy, Dairy Industry, Horticulture and Forestry were offered in 1904. After that things started to develop in the Agriculture world. Dairy Husbandry and Poultry Husbandry had a curriculum made in 1911. From the years of 1904-1958 2,740 bachelor degrees in Animal Husbandry were awarded. This number doubled any other department offered in Agriculture. It was then ranked second highest of any department in college, electrician being the first. Organic husbandry goal and jobs are things such as only giving the livestock organic feed, limiting the number of animals on a piece of land, animal manure not a problem of pollution, healthy eggs, milk, cheese, etc. instead of quantity, and many more things that are involved in keeping the animals healthy and making sure they produce healthy in return. The housing for organic animal husbandry is very complicated. 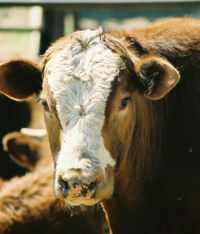 They require things such as their livestock having smooth but not slippery floors, calves must not be in boxes after they reach a week old, poultry must not be kept in cages, their water intake must come from a river or natural flow, and piglets must not be kept on flat decks or piglet cages. When these organic animals get sick they have a specific rules they need to follow. Number one being breeding. They try to breed as hardy and selective as they can. Along with accepting these hardy breeds they are required an adequate feed­ing, housing, sanitary conditions, and vaccines. If however these do not work and an animal is fallen ill then they must receive only natural or homeopathic treatments. Factory farming is a way of having your livestock moving as little as possible. The main reason for farmers to do this is to produce the most output but with the lowest price. By doing this the farmer uses economies of scale, modern machinery, modern medicine, and global trade for financing such as purchases and sales. The farmer in this case wants to yield the animals therefore he keeps them to strict confinement while it's growth hormones speed growth. After taking a poll they discovered that 74 percent of the world's poultry, 43 percent of beef, and 68 percent of eggs are produced through factory farming. In the U.S. alone four main companies produce 81 percent of cows, 73 percent of sheep, 60 percent of pigs, and 50 percent of chickens that we use today. Over 80 million out of 95 million pigs are killed a year for factory farming use. Geier Hitch is method used for livestock specifically. 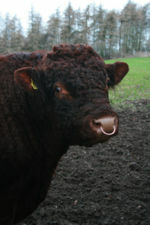 It is a method that is done by a rope being inserted through the nose ring of the animal which is attached to the animal’s nostril of the nose. 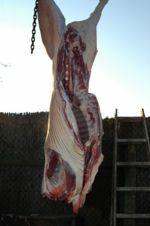 It is then pulled back along the belly of the livestock and tied into a firm knot at the scrotum which is at the base of the animal’s testicles, which will then induce stress for the animal. The animal will then feel tension and pain and it will then start to run around and buck whatever is in sight. This method is only used when transporting or handling a bull. Many people have fought for years about the cruelty of animals and how they are being used in animal husbandry. Many think that they should be able to live in their natural environment and be raised as if they are not being only used for money. Battles have been fought that the animals should be able to live as their ancestors have. Company’s on animal welfare such as Compassion in World Farming have been attacking these farmers who use cruelty in their business. There are many different career opportunities available in animal husbandry. These all depend on which field you wish to enter in. Things such as Shepherds, goatherd, swineherd, cowherd, and many more are many career opportunities for which you can pursue. Each of these things depend on which you wish to herd. Swineherd- is a person who cares for specifically pigs and hogs. Shepherd- cares for sheep. Goatherd- is a person who cares for goats. Cowherd- is a person who cares for cows. This page was last modified on 28 July 2014, at 19:35.